Relax . . . You’re on Vacation! Ahhh…vacations. They’re all good, right? I got back from vacation recently and this article spoke to me “Back from the Beach? You need a Vacation”. Oddly enough, it gave me comfort. Why? Because apparently I’m not the only nut out there that doesn’t feel relaxed after a family vacation. Whew! What a relief! I thought I was alone. Our vacation in the Outerbanks was really fun and it was great to see my sister (who lives many states away). It’s just the pre-vacay and post-vacay rituals that stress me out. Packing a family of 5 ain’t no game and is not for the faint of heart. Of course, my family thinks my packing rituals/routines are insane, but we rarely forget anything important or critical to our trip. I’m not a fan of the saying “If we forgot something, we can buy it!’. The pre-vacay routine has gotten a little better since my kids are old enough to pack themselves. When all of the kids were little, it was C-R-A-Z-Y (totyards, diapers, baby food, bouncy seats, etc.). The formal living room becomes the staging area and the pre-vacay routine typically begins on the Sunday prior to the Saturday departure. 1. If you want a certain board game, fishing pole or baseball mitt to come on the vacation, please place it in the staging area. 2. Your suitcase must be in this area emptied and ready for loading. 3. Please grab your pre-printed packing list from the counter (these lists are available a couple of days prior to departure). 4. If you have a favorite outfit that must go on vacation with you, please put it in the laundry at least 2 days prior to departure. 5. You are responsible for your own “fun” bag for the car ride – that means electronics, electronic cords, books, etc. 6. Friday is family truckster loading day and the pre-flight check. Once we arrive at our destination, it usually takes me about a day and a half into the vacation to get into full relaxation mode, but I do eventually get there. Since we rent a house on a lake, the minute we arrive (after an 8 hour car trip) we must immediately unload the van so I can go the grocery store (you all know how I LOVE The grocery store 🙂 ). I feel like I never really get a break from the stuff I normally do at home (grocery, laundry, cooking and cleaning). I wish we could vacation with an “Alice”. I mean, my husband is an architect! I thought the live in nanny was automatic (false advertising!). My bro-in-law appropriately stated that vacations are pretty much about the kids – I couldn’t argue with that! He can be very insightful :). That’s why my husband and I take a trip once a year – just us! That’s my real vacation every year (he can pack himself and clean up after himself :)). The news article really summed it up for me. I may have to follow some of the post vacation de-stressing suggestions in the article (except maybe the weeding – I don’t think that would relax me). 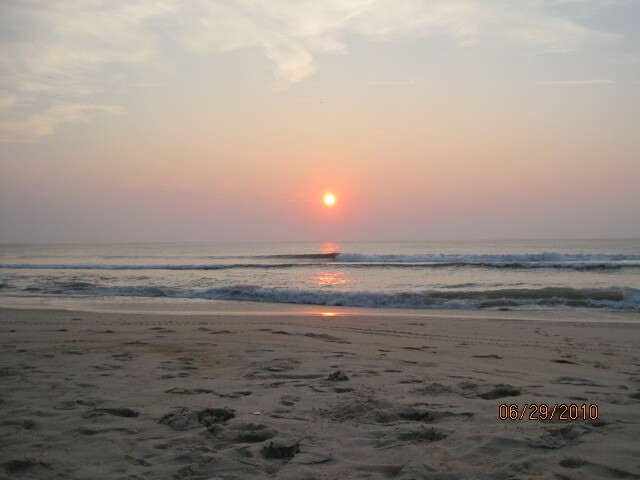 Here’s a relaxing scene from the Outerbanks! Beautiful, isn’t? This entry was posted in Everyday Life and tagged family vacations, packing, relaxation, stress. Bookmark the permalink. ← Really?! You Just Did That? I think you just need Prius. It took us about 1 hour to pack up the car coming and going. I had washed all of our clothes throughout the week so we came home with one small bag of laundry. It took 30 minutes max to unpack and the boys put their clean clothes in their drawers right away. It’s just Daryn’s and my suitcases full of clean clothes on our bedroom floor. The toughest part about leaving OBX was where to dump all that extra watermelon! Where would we put Jack? It’s that 5th extra person – darn it! This is great! You summed it up perfectly! The good thing about all this is, eventually the kids do grow up, move away and when you get together they relive the wonderful memories they had on vacation. I can totally relate to the staging room, the incredible list, checking off items weeks in advance….etc. In spite of all the teasing of taking too much, we never had to run to the store for what we left at home. All the vacation money was truely for vacation!! Now we are leaving for a Branson vacation today with three grandsons, minus their parents, their mommy has been the one running around making sure everything goes with them. I just have to make sure the bag of snacks are packed!! Life comes around!! From one detailed underwriter to another detailed underwriter! Miss talking to you but enjoy keeping up with your stories! When I pack it is usually one small bag. In there goes a few clothes and my Cabela’s travel bag that contains everything I could ever possibly need. I also grab my pillow because I don’t like strange pillows.